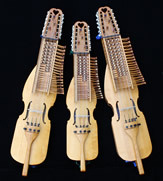 Here are links to other nyckelharpa related sites, You-Tube videos provided by us and others, and the sites of nyckelharpa performers around the world. We have just added a page of teachers who provide online lessons for those who have no local teachers. We hope you enjoy these links. There is a lot of information out there on the web, and we are providing a few of our favorites for your reference.